This site is dedicated to the Hobby of building Resin, Plastic, Metal and Multimedia model Formula 1 cars and MotoGP bikes also the detailing and super detailing involved, in scales from 1:43 to 1:6. This page will have NEWS of upcoming products from all over the World. 05/18/15: It seems like I have no time to right on the News page these days. As you know, we have been a dealer for the new Pocher kits, through Hornby America. Unfortunately, with a change of account managers my info was misplaced and we have not been receiving updates of new products. That has been resolved and I am pleased to announce a future release of a 1:4 scale Ducati Panegale S 1299. Due for release in September. At the same time two new Lamborghinis are to be released "Hurican" in Red (HK107) and Yellow (HK109). All these kits are slated for a retail price of $750 to $800.00. Pre-order for a discount. 01/27/15: 2015 is already speeding away. MFH has announced the price of the next Ferrari 250 GTO versions, and tops their high price list at 88,000JPY. A new record being 13,000JPY higher than the previous. I do believe this may have something to do with the weakening Japanese Yen, meaning that International buyers will be paying what they were about 3 months ago for MFH kits. I don't know if the Japanese will be paying these prices. If you want one, or want to check it out, look on the pre-order page. 08/28/14: Sorry! I have not been good at keeping up on the News here, although new things have been coming very regularly. The latest being the 1:12 scale full detail Ferrari 250 GTO from MFH. It is their most detailed and most expensive kit to date at 75,000JPY. You have to see the detail here MFH is pumping out kits in 1:43, 1:24, and 1:12 like crazy and all have amazing detail. Aoshima have released some new kits and will be in stock soo. If you are detailing a McLaren M23 we have a bunch of different detail parts in stock. 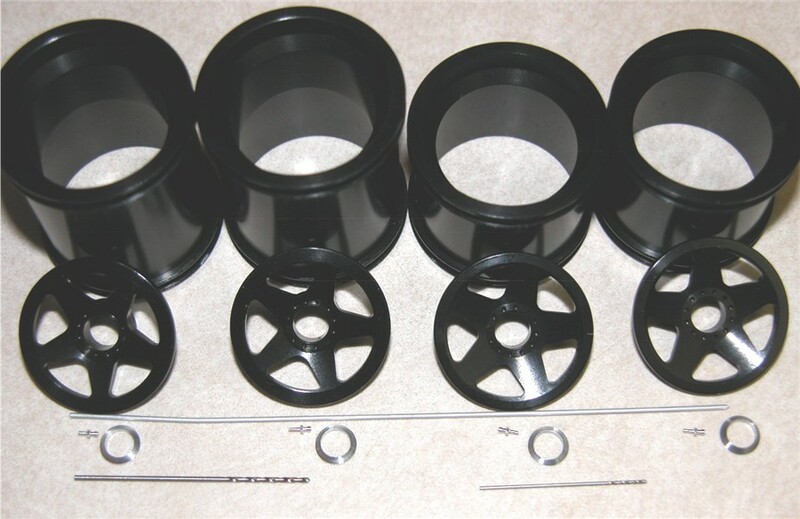 The new aluminum anodized wheels from AZRM for the MP4/6 1:12 Tamiya kit, will be in stock soon. Please look through the website. 12/18/13: The Pocher Lamborghini is now available and shipping this month. MFH has announced it is reproducing the 1:12 Full detail version of the Lotus 79 and 97T, these will be available to ship in January. Please check out the pre-order page for details. If you wanted one before but missed it now is the time to take advantage of special order pricing. We will not be shipping any International parcels from today, until after Christmas. Domestic and Canada, we will ship up to the 23rd December, for Priority mail. You have until January 2nd to pre-order the following Tameo Built kits TMB 020, 021, 022 and 023. Check out the pre-order page for the details. There will be none available for pre-order price after January 2nd. 11/09/13: MFH has announced the December release of two 1:12 Scale McLaren MP4/23 curbside kits, Monaco and Brazil. Also in 1:43, four versions of the Matra MS11 race car. These are all available for Pre-order. You will also find the re-release of the 1:12 Tamiya McLaren MP4/6, and new release of the 1:24 "LaFerrari" all available, in the pre-order page, plus some new magazines due for release in November and December. 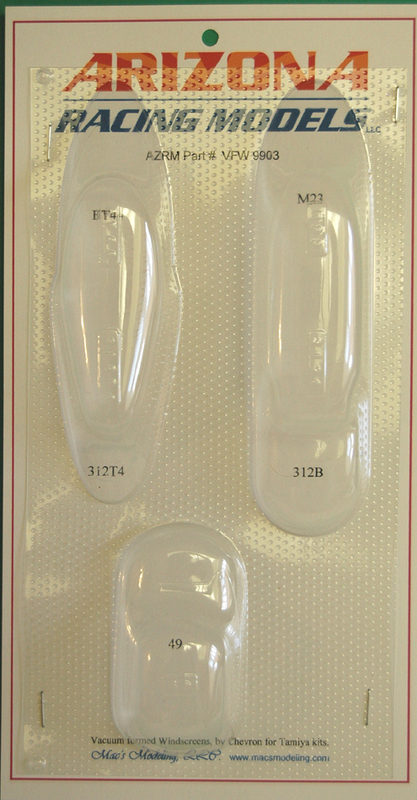 10/18/13: MFH has announced the release of a new line of kits they refer to as "lightweight kits". These are curbside Multi Media kits. Resin bodies, metal and photo etch parts, rubber tires. They are 1:24 scale and will be of Sports Cars. Check out the Pre-Order page for more details. The latest order from MFH arrived this week, and the New order of other kits and books from Japan, is due to arrive today. So check out the website in the next few days, for anything you may want. 7/6/13: New item added in the 1:12 store: Gearboxes from Brian L Fawcett Models & Patterns, in England. An early version ZF, BLF12001, and late version ZF BLF12002, as used on the Lotus 49's and 49B, plus the Hewland gearbox, BLF12003, used on later Tamiya 1:12 kits with a DFV engine. 6/10/13: Check out the "New Products Showcase" for the Narrow nose used on the 1974 McLaren M23 in Spain and Monaco. On sale now. Lamborghini Aventandor. It will be offered in Orange HK100 and White HK101. Doors, Hood, Boot and spoiler all move/open. They will retail at $799.99. We are taking pre-orders on them now. Release date is set as November 2013. So you have a while to save up for one. ;) Check out the Pre-order page. 2/27/13: A major change has happened on Mac's Modeling..............we have added a MILITARY ITEMS page. This page is in keeping with the idea of offering the Best. It only has High End full detail kits check it out, by clicking on the button on the left or here. Also check out the Pre-order page for new items from Tameo/Silverline, MFH etc. I am still very overwhelmed with work, but getting through it. 1/1/2013: 1 week sale starts, first come first served. The time of your email will be your order in line. Also you MUST put "2013 sale" in the subject line, or it will not matter when you send your order in. 12/4/12: We have been having a lot of Internet, server, computer and email problems lately. If you have not had replies to your emails, this is why. Sorry! I am trying to catch up on everything, although it is frustrating as we still have some intermittent Internet trouble. I have updated the pre-order page today. The MFH 1:12 Lotus 97T will be available in January, 2012. Check it out and see if there is anything you would like. 9/10/12: I will be out of the country, in Mexico, from Sept. 12th through the 18th, probably with no internet connection. However, you should be able to get any questions answered by Don, who will be checking emails. There are still more new things added, please check out the Pre-order page. 8/3/12: There are plenty of plastic kits that have been added to the 1:20, 1:24 and Sports Car stores, Many Out of production kits and all at regular prices. There will also be some more added to the 1:12 store. 4/10/12: As of today's date we will no longer process payments with Credit Cards directly. All payments must be made using Paypal you can use your Credit card there. Money orders and checks from approved customers will be accepted. Check out all the new items from T2M here and check out more new items throughout the website, which was updated today. 2/26/12. We have added a new page " Re-stock and New items arriving" it can only be accessed from here, or if you receive the News Letter. It will be updated at the end of each month. 2/15/12. I have made contact with a new distributor in China over the last couple of days, and will be offering some new items through them. The first of which is from a company called 3X Model . Check out the MotoGP store for a KTM RC8 R 1190, full detail 1:12 kit and a full detail Arai RX-7-RR4 helmet. We will also bring back some Crazy Modeler Hobby Dragon (CMHD) items. We will also introduce a 1:24 scale line from A+Club, so keep an eye on the website for updates. 11/10/11. With my granite business being busy, I forget to update the News page. It seems like things are happening so quickly, with the model business........new items being released and older items being re-released, the website is changing almost daily. There have been so many new things lately, please go to the Pre-order page frequently to check out new items. There are a bunch for this month. 8/13/11. Well, how embarrassing! 9 months since I updated the News page. Obviously a lot has happened in the model world in that time. Too much to mention here. The biggest news, is going to be a change in the way I price pre-orders for items coming from Japan. I will quote prices in Japanese Yen, and you will have to use Paypal and pay in Japanese Yen for the items. I am doing this because the exchange rate has fluctuated dramatically recently and I have lost money because of it. The other, I think big news is MFH is releasing Photographic Journals of period pictures taken by Joe Honda. They are GREAT reference material and are up to Volume 8 already. Check them out in the reference material page. Please check out the Pre-Order page for new items, and have a look through the whole website, as I have just updated every page this weekend, and there is something new on almost all of them. Especially the reference materials. This month though, you need to Pre-order the MFH Tyrrell 006, full detail kit by August 22nd. 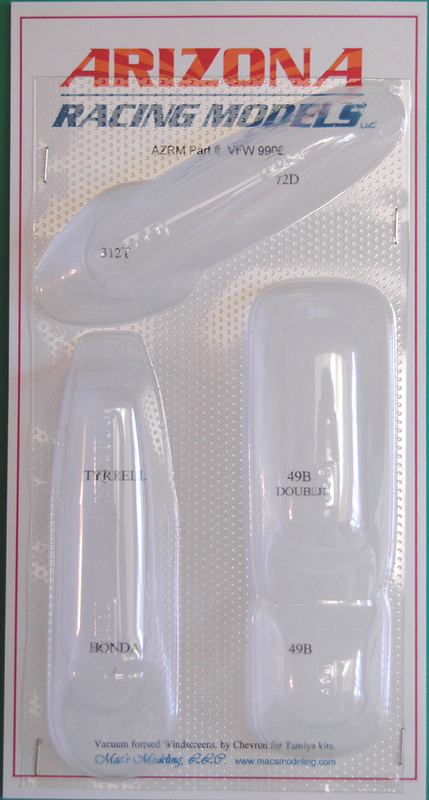 There is also the new 1:20 kit from Fujimi-Ferrari F2003GA. 11/13/10. I have been so busy I have not updated this News page for 2 months! Sorry! So much has been happening. Please check out the Pre-order page. F1 Modeling Vol. 44 is available and a new magazine available in December - "Joe Honda racing pictorial series" Vol. 1 covers the Lotus 97T. New detail parts, conversion kits, re-released Tamiya 1:12 and 1:20 kits, plus new kits and parts from a variety of companies due out soon. You need to check out the pre-order page and the other stores for all the new items that have been added in the last 2 months. 9/17/2010, I have finally got Icon Automotive Miniatures rain tires listed in the 1:20 detail store. There all also some new items on the Pre-order page, which will greatly interest some of you e.g. 1:12 scale McLaren M23 and 1:20 scale M23. Also, MFH has their latest release available now. Lotus 46, K270 and K271, from S, Africa and Belgium. There are plenty of new items on the Pre-Order page, you should check out, including some new items from AZRM, namely white metal cam covers for the Ford/Cosworth DFV engine. Take advantage of all the "Pre-Order" discounts. You do not have to pay until the items are ready to ship. 6/19/2010, To try and make it a little easier to know when items can be pre-ordered I have created a page especially for "Pre-Orders" it will have everything I know about on it. There are quite a few new items right now. If any of you know of other items that would need to be added, just email me. I have also made the Credit Card Authorization Form available to be downloaded from the website now, here and from the Ordering page. 5/11/2010, I have re-negotiated fees with American Express so I now accept AMEX again for anyone who prefers to use that Credit Card. Pre-order special prices are now over for the Fujimi, Hasegawa and Tamiya kits. 5/1/2010, Model Factory Hiro has announced the release of the Indianapolis version of The Lotus 56, available Mid May, retail price of 29,000JPY and the release date for the Brabham BT45B is also Mid May with a retail price of 14,000JPY, check them out for pre-orders on the MFH page. You only have until May 9th to pre-order the Hasegawa Lotus 79 and the Fujimi Williams FW14B and Brazil version of the FW16, to receive a 15% discount off the retail. Check out the ordering process in the 1:20 store. 4/7/2010, Latest News from Tamiya, is they are releasing a plastic kit in 1:20 scale of the Lotus 79 and a separate Photo Etch set, officially on May 29th. Check out the pictures. You can save 15% on the normal retail price if you pre-order before May 1st at Tamiya@macsmodeling.com and put LOTUS 79 in the Subject line. All the new Fujimi FW16's came and went, they were all sold before they arrived, I will have to get some more. If you would like one please send an email to fujimi@macsmodeling.com. I have added some new decals to the F'artefice stock, but they sell really quickly. I have another order processing, so if there are some you specifically want that are not in stock send your request to artefice@macsmodeling.com. I have also added a new page to the website, for those of you who prefer to have the kit already built, check out the Hand Built page for details. 2/14/2010, I have added the MFH latest edition to be released in March, the Matra MS80, three different versions. I don't know the price at present, but I will guess that retail will be 29,000JPY. I should receive the latest order from F'artefice in approx. 7 days from now. 2/4/2010, Apart from being very busy, with the granite business lately I have been having some intermittent email server problems, and also anyone with @yahoo.com seem to be rejecting any emails from me??? I am going to try to contact everyone today. 1/16/10, There is a lot of News. MFH has announced its move into the Plastic injection model market with the Ferrari 312T4 in 1:20 scale. They refer to it as a "Hy-brid", because it wil have PE sheets, white metal parts, machined parts......unlike any other plastic kit on the market. It is in the design stage so I would expect it around the middle of the year. They have also just released three March kits, K248-March 711, K249-March 721 and K250-Eifelland 21. 1:20 scale, full detail retailing at 27,000JPY. Check them out on the MFH page. The latest order from F'artefice decals should be here by Jan 25th. They have almost all been sold before they arrive. So I will be placing another order very soon. If you would like something from them pleas send your request to artefice@macsmodeling.com thank you! I took on a part time job, because of the current financial situation and since then everything seems to have got busy, including the Granite business, leaving less time to update the website. However, it is current on inventory, and I plan on keeping it that way. Peruse the website, there have been a few additions that I have not mentioned here, but will be adding more news soon. 12/6/09, MFH has announced the limited edition release of the 1974, Ferrari 312B3 in three versions, you can pre-order yours at 312b3@macsmodeling.com for delivery and details check out which one you want at the MFH store They will also be releasing two Early versions of the Lotus 77 in January, as raced in Brazil and the other in South Africa. You can pre-order these as well. I will be placing an order with Tameo on Tuesday, Dec. 8th, if you would like something to be ordered in particular, please send your request to tameo@macsmodeling.com Also, Tameo announced it will release the Ferrari 312 B3 Spazzaneve "Snow Plow" in January, I am taking pre-orders on those now as well, you can pre-order at the same Tameo email address. 11/29/09, For the time being I will not be re-stocking any models from Fujimi, Tamiya or Hasegawa. Also I will not be restocking any decals from Museum Collection. This is temporary, until I get back on my feet financially. All Items I had on order from these companies have been put back into stock at HLJ, so if you were waiting on something from these companies, you will be able to get it directly from HLJ right now. Sorry about this. I will still be stocking TABU and F'artefice decals. In fact there are a couple of TABU decals coming in you may be interested in. 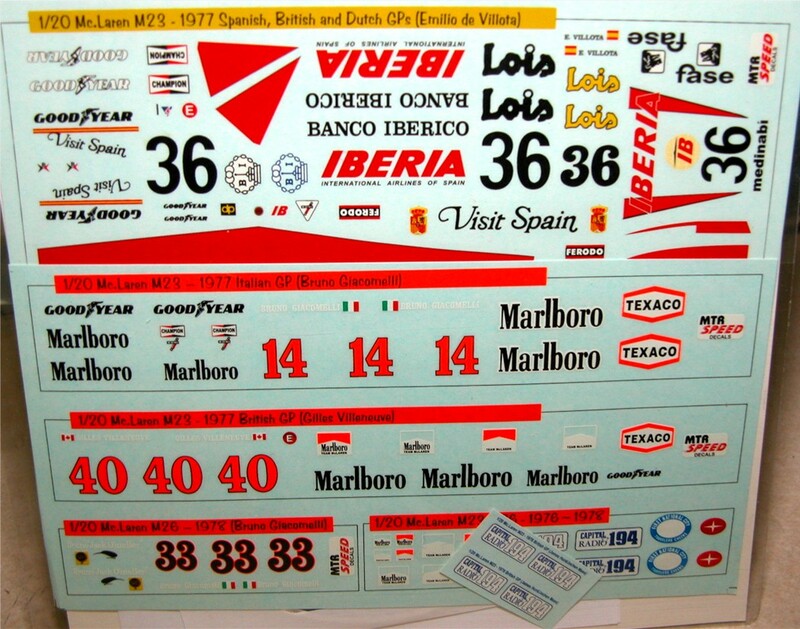 Tire decals for 1:20 and 1:12 scale. You can find them in the appropriate store and should be in stock Nov. 30th. There will also be some new items from MFH, grooved tires for the 2000's and rain tires for the 80's, they will also be here approx. Nov. 30th. You can see them in the 1:20 detail store. 10/28/09, There are some new releases announced by MFH. The Force India, VJM02, curbside at 15,000JPY you can pre-order at MFH@macsmodeling.com also a 1:24 scale, full detail Ferrari 250 LM, 68 of Piper and Attwood, K243, at 29,000JPY and the latest 1:12 full detail, Motorcycle kit the GSXR1000, winner of the Suzuka 8 hours, 2009, with rain tires for 29,000JPY, you can pre-order that at K242@macsmodeling.com. All will be available mid November. 9/8/09, MFH have announced the release date as Mid September for 4 new full detail kits kits, K234-Ferrari 500F2, 1953, K235-Lancia D50, 1955 Monaco, K236-Ferrari 801 Long nose, 1957 and K237-Ferrari 801 Short nose, 1957. You can pre-order these by going to the MFH store and clicking on the appropriate email address. They will also release the Brabham BT48 in September. The Lotus 77 will be in October. 8/12/09, Well as expected (by me anyway) the new Lotus 49 and 49C kits will be released in approx. 1 week, at the same price as the previous 49B's - 29,000JPY. There are 3 version check out the MFH page for pre-orders. Top Studio has also released a lower priced, not so detailed set for the McLaren MP4/13, a brake set version 2, which is the brake set for the MP4/13 and also some Photo etch hose clamps, check them all out on the "Details" page. I have been working on the Lotus 72C kit and moved the progress diary to a new website, that is still under construction, however you can get to from the "Lotus 72C 1:12" page on this site. 7/29/09, The first batch of MFH Lotus 49B's came and went like hot cakes. And this week they announced the production of the much anticipated 49 (Green and Yellow) and 49C, along with future releases of Lotus 56, a new Lancia D50, Ferrari 500F2 in 1:20 along with a Ferrari 801 and 312B3. They sure know how to pick em! F1 Modeling Vol.39 has been released and can be ordered now at F1modeling@macsmodeling.com it covers the first 6 rounds of 2009. AZRM, I am happy to say will produce a 1:12 scale "Superside" LCR sidecar outfit (you will have seen these at the Isle of Mann TT). in the future, you will add your own engine. The second batch of Top Studio detail sets should arrive next week. The first batch were gone before they arrived. 7/14/09, I am restocked on some Museum Collection decals. The latest release from Top Studio, the detail set for McLaren MP4/13, will be here very soon for those that took advantage of pre-ordering it. Model Factory Hiro announced the release of their full detail March 701, details can be found in the MFH store there are 3 versions and you can pre-order them until Friday 17th. Which is when I will place the order. I also have a new order at Tameo, if there is anything you would like please email at tameo@macsmodeling.com also by Friday. There are also a couple of Studio 27 and Wolf kits for sale in the 1:20 store. F1 Modeling has had a bumpy ride since Sankaido claimed Bankruptcy last year, then Tohu Shuppan took over, then in May this year they had to reorganize, but luckily they have come through it and are now releasing Vol. 39 which will be released shortly. 6/27/09, The first of This Way Up kits will be here early next week. 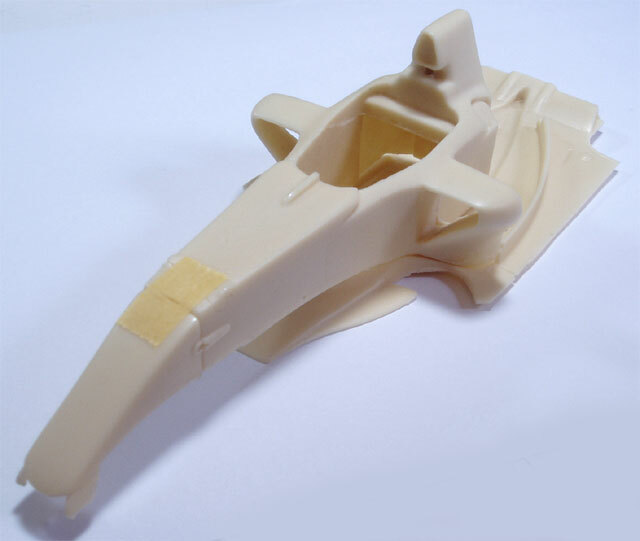 Also the Lotus 49B's have been released and the first batch will arrive next week also the Porsche 908/2. A new Tameo order has been placed, if you want to add something to it email me at Tameo@macsmodeling.com. There are a lot of new kits being released. Ace Models has closed down its operations and cancelled all further releases. However, a new company out of Brazil has appeared called "Chequered Flag" their first releases are of Heskith cars. I will soon have then up on the website. 5/1/09, Financial cutbacks mean I have to change the Corporate address to my home now. Which I did as of today. Not a big deal except for anyone that uses that address for me. Please note the change. 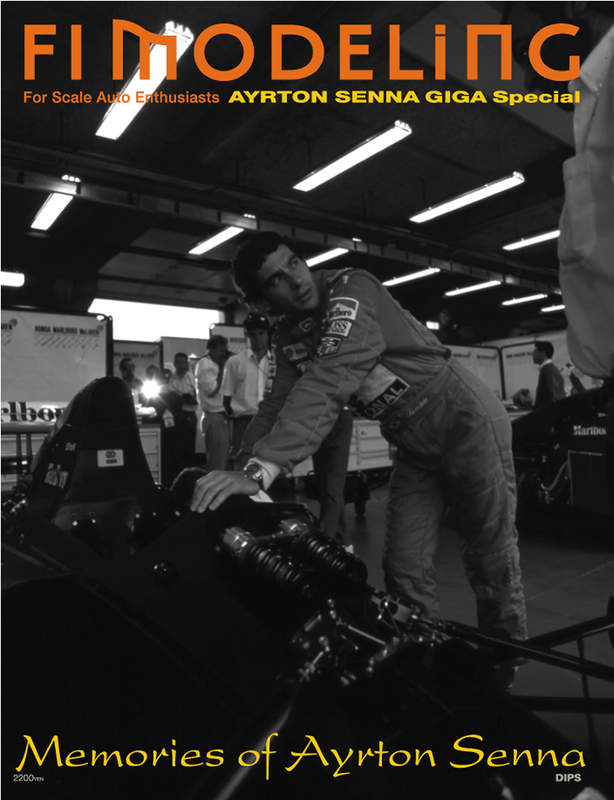 The Senna Giga specials have arrived and I am in the process of shipping them out. I only have a few left. 4/17/09, Re-released, available last week of April, see "Ref. Material" page to order. This will go quickly, there are only 2,000 for the World. You have until April 20th to pre-order and save money at f1modeling@macsmodeling.com after that you pay full retail. F-Artefice decals should arrive tomorrow, they have arrived in the USA. 4/12/09, Have I told you I hate computers! Especially when there is problems. I think I'm out of the woods now as I have had a steady connection for a few days. Hopefully it will stay that way now. 3/20/09, I am still having intermittent SERVER problems, which will apparently continue, until the website gets moved to yet another server! Please bare with me. Sorry! I have ended the current order of decals with F'Artefice, but I am starting a new order which will be placed at the end of March, beginning of April. I am waiting on shipping information from Tameo so I can let you know when to expect your kits. I am also waiting on the shipping information from MFH for the Ligier JS21's and other kits. 3/17/09, New deal has been made in Japan, so I can offer F'Artefice decals. They will be here at the end of March. I have also created a special email address for ordering Artefice@macsmodeling.com their decals as these come from a different supplier and I am able to create small orders. You will find a selection in the 1:43, 1:20 and Die-cast Stores. 3/16/09, I apologize for the site being missing for the last few days it was AWL, Absent Without Leave. I have no idea what the problem was, but Go-Daddy changed the Server and given it a new IP address to correct the issue. So hopefully all will be well again. I have been updating the site although I could not publish it to the web since last Thursday. If you still have problems, please email me. 1/19/09, Model Factory Hiro have announced the retail price of the New Lotus 97T at 30,000Yen. Two versions Portugal K217, with rain tires and Belgium K218. I am also able to offer you "This Way Up" 1:43 scale F1 kits now. I will be adding a full list to the 1:43 store shortly. 1/3/09, Happy New Year to everyone! I wish everyone all the best for 2009, and hope we can all get through the hard times coming. I have changed the Navigation bar slightly on the left. I have removed the buttons for the Jordan 911 creation and have added a button for the Model Factory.!. This is for what projects are/have been going on in my workshop. 12/15/08, Well things are hopping on the New release front from MFH. They have just announced a limited run of 50 pieces, re-issue of the Williams FW16, all three versions, for December, also 16 piece limited re-issue of K198 275P/330 LM Sprint. They will go fast! January: Toleman TG183 full detail kit and B187 Curbside kit. 11/30/08, I hope you all had a good Thanksgiving. I have added a couple of items or should I say "updated", the Ferrari F2008 from MFH. I added some pictures and the model numbers and retail price 22,000Yen. They should be available mid December. You can pre-order at F2008MFH@macmodeling.com Please state which model you want of the three. MFH has also reduced the price on a couple of items Ferrari 126 upgrade kits for the Christmas period. Releasing an economical upgrade kit with no metal parts as well. There is also a new link in the MotoGP page to items that were on Detail And Design in Scale's (DADS) website. At the moment it is all Studio 27 items, but there will be more items added soon and will eventually be integrated into main page. 10/24/08, MFH have announced the release of a Ferrari 126C3 from the Dutch and German GP. Full detail kit which will retail at 29,000Yen. Pre-orders being accepted at 126C3@macsmodeling.com F1 Modeling Vol. 36 magazines are now in stock. 10/18/08, F1 Modeling, Vol. 36 magazines, will be in stock at the end of next week. The new STR3 Italy versions will also arrive at the end of next week. There were only 60 kits produced. I have added a page to the website for customers who want to sell unwanted kits "Customer Sales" I do not collect money or have anything to do with the sales. They will be conducted directly with the seller. I charge nothing for you to advertise on it. Read the page for more details. 10/11/08, Well they said they were not planning on releasing it......but they have! E-JAN # E810 is the Vetel version of the STR3 as raced at Italy. Limited to 60. It will be released Oct. 17th. 9/16/08, The E-Jan RB4's and STR3's will be released today and should be in stock next week, if you pre-ordered them. Re-stock and new decals from Museum Collection and TABU, plus a few other items will be arriving in the next week. 8/16/08, The release of the RB4 and STR3 cars in 1:20 scale, Curbside (No engine detail). The decals have to be ordered separately. 7/15/08, Volume 35 of F1 Modeling arrived today, there are only 2 copies left at $24.00 each. 7/10/08, Due to problems with the original distributor I was using for the F1 Modeling magazines, I have switched to a new distributor, which means I have increased my order and I do have extra copies available now, so if you do want to get in on a subscription, now is the time to do it at f1modeling@macsmodeling.com Don't miss out on future issues. I will be making a new order to Tameo around July 14th. If you want something special email your order to me at tameo@macsmodeling.com before the 14th. 6/11/08, A new publisher has taken over the production of "F1 Modeling" magazines. They will be continuing with Vol. 35 due to be released shortly, which will be the 2008 race cars "under the microscope". The are also re-releasing the 1976 F1 Grand Prix magazines, Vol 1 and 2, in the next two weeks. 5/9/08, Due to the major fluctuation in exchange rates, most prices on the website are incorrect, except for items which are "In Stock", all others will be quoted to you at current exchange rates at the time you place your order. Due to the economic climate around the world I have had to take on a full time job again to support me and the website, which means replies to you emails will be slower. Sorry about that! I will work on it as the time goes on though. 3/25/08, The Lotus 72C's came and went very quickly, there are some more due in a few weeks. The Ferrari F2002's will be arriving the end of this week and already the ones earmarked for "stock" have been sold. This is a very popular model as are all the latest MFH kits. I have restocked some decals in various scales and will be receiving more in the near future. There are a couple of new Studio 27 models in the 1:20 store. I have been doing some work on the 1:12 Lotus 72C kit and have updated the web page diary today. 2/25/08, Model Factory Hiro Lotus 72C's will start arriving at the end of this week. They have also just released information on their latest release. The Ferrari F2002, full detail 1:20 scale. 3 versions will be available - K193 France, K194 Italy and K195 Japan. To pre-order email me at F2002@macsmodeling.com and don't forget to say which version you want. 2/13/08, Happy Valentines to all! I actually have managed to get through all my inventory and updated the website, so everything, with the exception of the paints, should now be accurate, for what is in stock. I have even added some items I had sitting around but never managed to put up on the web, mostly Carbon decals and some detail parts. Talking of which the restock of the 1:20 wheels should be back from anodizing next week. The MFH F2007's came in and went out before I had time to put a stock on the website. They are still available, so if you want one just email me and I will get one for you. 1/16/08, The first news update of 2008. Model Factory Hiro announced the future release of the, long anticipated, Lotus 72C in Gold Leaf and Rob Walker versions, due out in February. They also announced the release of a Full detail Ferrari F2002, due out in March 2008. You can pre-order these from me just follow the link on the MFH Page. I have also added some more colors and sizes of heat shrink tubing, you can find that in the "Finishing Materials" page. 12/29/07, Last news of 2007. Not much really, just some changes to the 1:20 scale store. 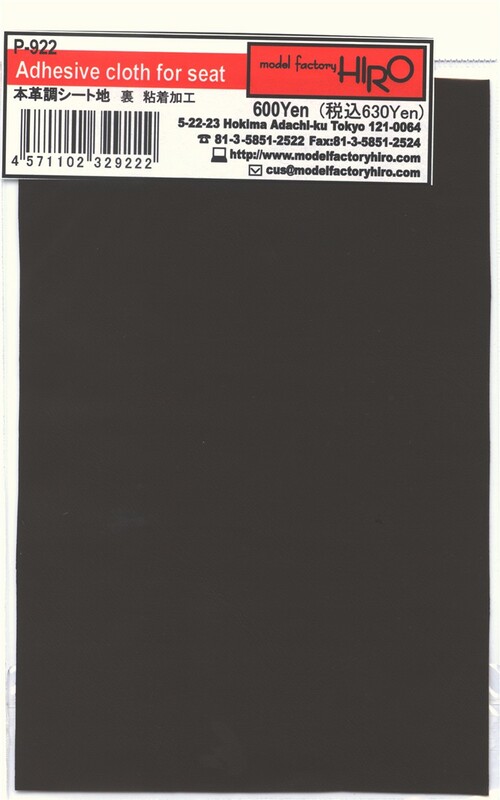 I have added separate pages for Model Factory Hiro, Studio 27 and ACE Models because they have so many models to offer. I hope this makes it easier and quicker to get where you want to be. Have a safe and Happy New Year! 10/25/07, Added new Pre-Order for MFH Ferrari 2007, in the 1:20 Store. There are three versions, all are curbside, the price is unknown at the moment. 10/13/07, There are some new Pre-order models in the Sports Car store, namely the MFH Ferrari 312PB in 1:24, full detail. 8/29/07, MotoGP Store is now open! Dave of "Detail and Design in Scale" and myself are joining forces. Over the next few weeks/months all items that Dave has in stock will transfer over to my website, so check back frequently for new items. I will be running the website and sales, Dave will be concentrating on making detail parts, trans-kits and in the future full kits. 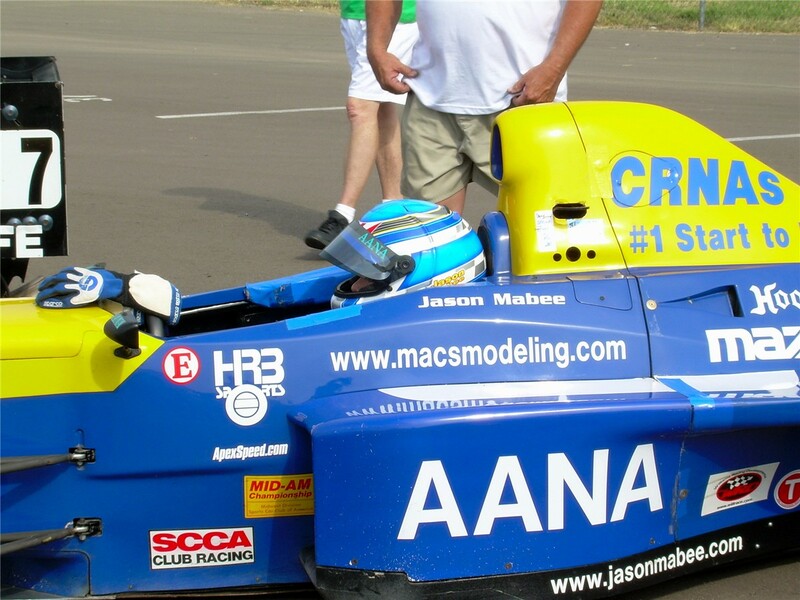 8/21/07, New advertising campaign started over the weekend, with the help of Jason Mabee ("up and coming" race car driver) and his race car check him out www.jasonmabee.com got the website on the sides :) "Up and coming Model supplier/manufacturer. Not much NEWS except because of the size of the 1:20 Store I have made it into 3 pages now, so it should be quicker and easier, instead of having to scroll down the page, just click the link. Thanks! 6/3/07, Well it was WET, WINDY and COLD in England, exactly as I expected it to be. ;) I had a good meeting with Clive Chapman while I was there and it now looks immanent for the release of the MFH Lotus 72C in 1:20 scale, metal, full detail kit as I did gain his verbal approval for it. Since returning on May 29th. I have had phone, fax and Internet problems. :( So please bear with me until it gets sorted. Apparently it has been due in part to vandalism (Copper thieves). However, it has given me time to unpack some more boxes from the move and find missing inventory, so the website is now current on inventory. Plus I had 3 orders arrive while I was in England, so I have a lot of orders to fill now. 5/15/07, I am about to leave for the airport and England. I will be back on May 29th, late. I will be able to receive and send emails via my laptop (I hope!) It works here via WI-FI. So it should in England. The order of F312's from MFH did not arrive as did two other packages from Japan! :( So everyone waiting for 312's and Museum collection, ST27 etc. You will have to wait until May 29th now. Sorry! This has never happened before. 5/11/07, Still in the final motions of the move, however, I have just added some more detail parts from Top Studio. You can find them in the 1:20 store at the top for pre-orders. They are all priced now. It will still be a while before I am back to normal as I have to go to England for 2 weeks starting on May 15th. I am taking a laptop with me. So theory has it, I will be able to at least answer emails. 5/8/07, I am still in the process of moving. I have way more stuff than I thought, then the day I could get some help, I had to cancel it due to utility hook ups etc. Sorry Frank! The site is up to date for inventory. Now I have to go through all the emails and orders. 4/3/07, I have added a "New Product" page, that can be accessed from here and the Home page links. Eventually I will put a button on the left for it. This is basically to showcase new products that I produce under the AZRM banner, with descriptions, use and pictures. 3/17/07, Happy St. Pats to all! Finally I am getting more of my Museum Collection order in, it's still not complete, but it's getting there. I will be carrying the Tamiya re-released 1:20 kits MP4/13, MP4/4, MP4/5B and the Lotus 99T. Plus the 1:12 kits with the extra added photo-etch parts. 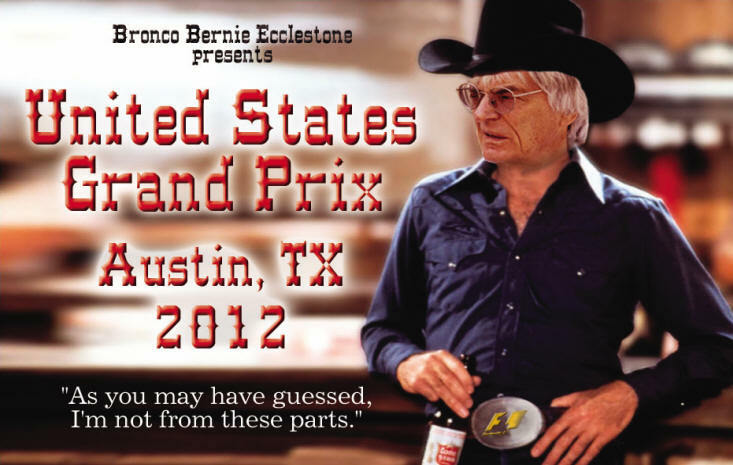 What about qualifying in Australia!! There's a shake up! It is definitely going to be a good year in F1. 3/9/07, I'm having a blowout sale! I have to move so the less stock I take with me the better. :) Check the link out Blowout Sale please only order using the email address for the sale. It is only going to run for 7 days. Email date is your priority. 2/24/07, Latest News is; I have been accepted by Matthew Wells as a Scale Motorsports official Dealer. This announcement has already had great feedback from regular customers. I will be adding their items over the weekend. In the meantime SMS have just put up a new website. I will be receiving the Model Factory Hiro MP4/5's this coming week. Thank you for all your pre-orders! I have held back the F40 order until after the arrival of the MP4/5's. I have just added some progress pictures for the F2004, which seems this model will have even more detail than the F2003GA, (as if that was possible). The Iritani models should be arriving soon. Express Mail from Brazil is not the best. Unlike from Japan which is usually 3 days! Also the 1:20 scale inlet trumpet set from Icaro will be in shortly. I am looking forward to those. 2/3/07, The re-stock of MFH Williams FW16 have arrived along with a few other "Out of stock" models. I have also added to the 1:43 store. Also I am taking Pre-orders at tyrrell012@macsmodeling.com on ACE Models Tyrrell 012, there will be 9 versions, two with rain tires. NOTE: There has been a change in ACE model numbers since some of you pre-ordered. I will email you to inform you of the corrected number. 1/30/07,(Updated 2/1/07) I will be receiving some kits from Iritani, that have not been available for some time, namely the Yardley McLaren M23 from 1973 along with some of the Tyrrell P34 experimental 6 wheeler. They should be in stock in a couple of weeks. I am also taking pre-orders for the new MFH releases, McLaren MP4/5, email your orders to MP45@macsmodeling.com Japan GP version in full detail, due to be released in February and the F2004 full detail, email orders to F2004@macsmodeling.com due to be released in March. There should be 4 versions of that. 1/2/2007! Sorry for not getting the News up to date until now. You have probably noticed the New look of the Home Page. I hope you like it. 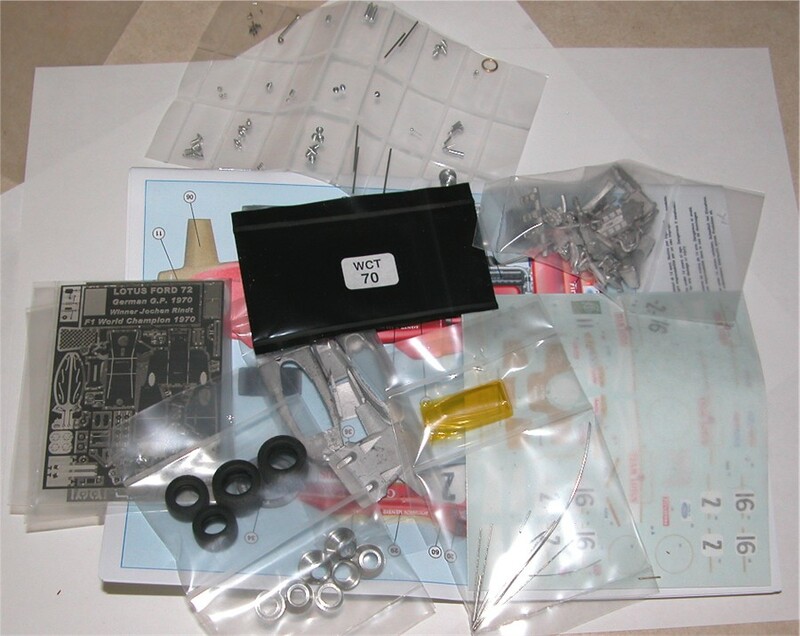 :) Now, Tameo kits and parts are arriving, tomorrow, Jan 3rd. They are listed in the 1:43 Store. 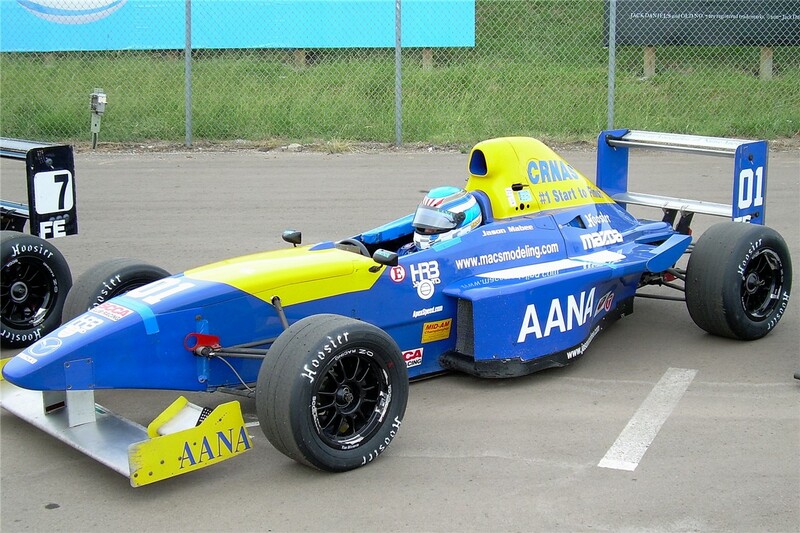 I am taking pre-orders on ACE model Shadow DN5's which have just been released. I have recently received some Studio 27 models, which are listed in the 1:20 Store, including the Brazil/Japan Ferrari 248 version, and the Super Aguri model. The re-released MFH FW16's should be in stock in about a week. I suggest ordering early, like now, as these disappear quickly. I have finally got around to adding some models in the 1:43 Store. I have not been concentrating much time on it, so I have placed a long overdue order with Tameo, for some WCT, TMK and Silverline kits. It includes the Brazil version of the Ferrari 248, the latest release from Tameo. The order will be shipped when the Ferrari is ready, which means about 30 days from now I should have them in stock. 11/16/06, I placed the new order with MFH today, which is basically for the new 1:20 scale Ferrari F2003GA. There are also some restock items and new products included as well as a couple of other different models, that I will be adding to the other stores. I updated some of the items in stock, so everything listed as in stock, should be. 11/9/06, I am taking pre-orders for the NEW ST27 release, Japanese GP version of Ferrari 248. Due in stock Late November. I also just added some extra pictures of the ACE DN9B Shadows to all versions. 11/7/06, I have added the photographs of the finished ACE Models DN9B Shadows. I will be placing my order in the next two weeks. So remember pre-orders get discounts. :) Also the Alfa Romeo's arrived and I only have two different versions left, one of each. 11/5/06, Pink Floyd's Meddle is playing in the background.............. :) Ah it's a good day! 11/1/06, Museum Collection decals ARRIVED!!!!! Some are missing but most arrived, one of the 1:18 scale sold out already! I will be receiving some decals produced by Marksman of Canada shortly. They are for die-casts mostly. 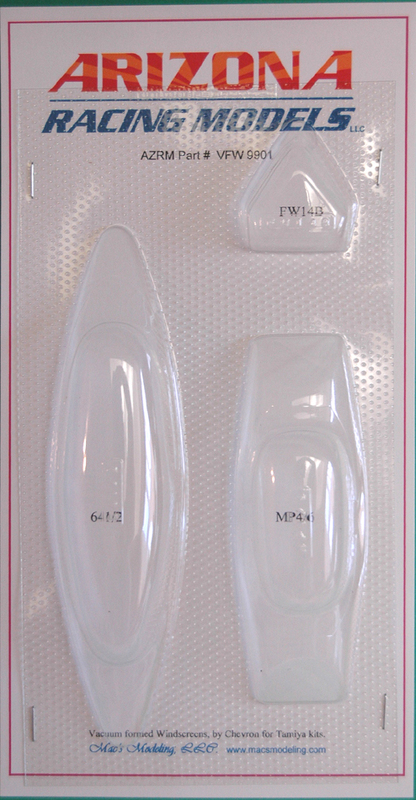 AZRM: I now carry the Vacuum formed windscreens, for the Tamiya 1:12 kits, produced by Chevron. Part #'s 9901, 9902 and 9903. $22.00 per set. Chevron will be producing the windshield for my Lotus 72C project as well. MFH: (update 11/2/06 added new pictures) The next release being the 1:20 Ferrari F2003GA is scheduled for release November 16th. I already have some reserved, but if you would like to add one to the list please email me. None of the versions will come with any Marlboro markings. RED 5: The FW28 full detail model, although delayed, will be the Brazilian version. ACE Models: I had the privilege of seeing the prototype and decals for the upcoming release Shadow DN9B Samson, the decals are amazing!!! The main Lion decal will come in multiple parts for ease of application, but they fit together perfectly. The kit will also include a decal solution developed in Brazil, which apparently works well with all the decals from Brazil. It will also be available separately. I have started the story of my trip to Brazil this year on the "Race Trips" page. 10/25/06, I am back from Brazil, What a race! New models arrived while I was there and I have just updated the stores with what is available. I have added "RTN" and "Iritani" as a line I will be carrying as a regular from now on as well. Museum Collection decals have not arrived yet, but I did get an email saying some of what I paid for was no longer available! This company is something else! However, I should have the decals by the beginning of next week. 10/8/06, (updated 10/9/06) MFH will be releasing the McLaren MP4/6, K137, in full metal detail later this month. Also next month will be the release of the Ferrari F2003GA, 4 versions, K138 Spain, K139 Monaco, K140 Italy and K141 Japan. Pre-orders being taken now for these at preorders@macsmodeling.com Price in store is 10% lower than normal retail. 9/30/06, I have just added some new and more stock to the Finishers paints, which arrived today. Purchased my airline ticket to Sao Paulo today. :) That's all the news for today, as I have been packaging the wheel sets, and orders. Thank you all! 9/28/06, FINALLY! 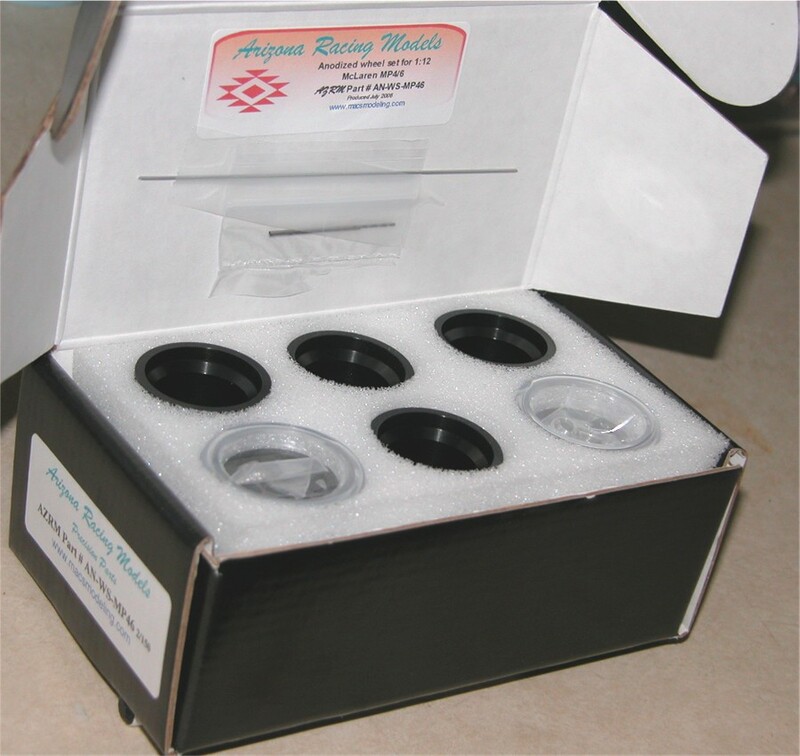 I have received the packaging and boxes for the 1:12 scale anodized wheels. So I am spending the next couple of nights, boxing them up and will start shipping them on Saturday. :) This is a very historic point in time for me............the first Detail item produced by me going on sale! I have learned a lot with the first set of wheels, so I think everything in the future will be much easier. 9/24/06, Well so much for the packaging company! ..............screwed it up again! So no wheels shipping yet! Sorry! I have added some more items to the Ref. Material page, namely Formula Perfect manuals and the latest F1 Modeling Mag. 9/19/06, I am expecting the boxes for the Wheel set tomorrow 9/20, and I have just added a picture to the progress pictures, showing everything included. So they should be ready for shipping on Friday 9/22. 9/14/06, I had been trying to carry WOLF Models and ORANGE HOUSE models on my site as you all know. However, David the owner of WOLF has decided, for whatever reason he has, that he does not want to do business with me. His English is so poor, as is my Portuguese, so communication was difficult at best. In fact I was trying to order approximately 45 models...........he quoted me $190.00 each, that's HIGHER THAN RETAIL! So it is obvious from that he does not want to sell models to me. He is not a good person to deal with. infringement of our trademark rights. keeping in stock or exporting these cars. I have already responded to RED BULL confirming I will comply. The packaging company had a problem when printing the boxes for the wheels and have had to re-run them. This is getting really frustrating, but I am sure I will be able to ship them out next week. I have also decided that I'm going back to Brazil this year (instead of Japan) for the final GP, as it will be an Historic race and day! 9/9/06, The first of the ACE Models Tyrrell 006 have arrived and are ready for immediate shipping (Free shipping in the US and discounted for the rest of the world). MSM Creation driver decals arrived a while ago but I forgot to tell you. There are some great versions for Schumacher from 1991 at Jordan thru to 1996. Plus some nice new ones for Senna, Prost and Mansell. I am waiting on another decal order from Museum Collection, which hopefully will not take as long as the last one did. 8/13/06, I have added the "Diecast Store" to the website. This is basically for the people who want to convert their 1:18 and 1:43 diecast models to the sponsored version, there are also 1:8 scale helmet decals. Soon there will be some 1:8 helmets, and some 1:18 and 1:43 diecast cars. Of course in keeping with the website, it will only be relative to Formula 1. I have also updated a few items. I will soon be receiving NEW driver decals for Raikkonen, Senna, Schumacher, Prost and Mansell all 1:20 with some 1:24 Raikkonen. I should receive a "proof" of the packaging for the wheels on Monday August, 14th. 7/9/06, Added more progress pictures of the MP4/6 wheels. 7/3/06, I have updated the progress on the McLaren MP4/6 wheels. The first batch is completely machined, they now have to be anodized. Now I have to decide on the packaging! Never thought about that before! Also so more progress on the 72C project. I have also added some new decals from MSM creation; Driver decals for Fernando Alonso, in 1:24, 1:20 and 1:12 scale. They are not in stock yet, but are winging their way to me as I type this. 6/16/06, As a lot of you discovered I made a mistake about Finishers paints......NOT all of them can be used right out of the bottle................in fact only very few can. The rest require thinning. I have added "Detail Masters" AN fittings and braided lines to the finishing materials page. There are no pictures yet, but if you have not seen these, they come in seven different sizes in the four different types. Used with the braided line and some tubing, you can add some great detail to your models. I have also listed the quantities of AlcladII paints that I have in stock. The big news is that the 1:12 Aluminum wheels for the McLaren MP4/6 should be ready earlier than expected. The bare wheels should be ready in two weeks! Then I have to fit them into the schedule at the anodizer's. Also MFH have just released 3 new models, Ferrari 156/85, 126C4/M2 and 126C4 S, from the Belgian GP. I should have these in stock very soon. Reserve one now if you want one at less than Web Price. Also the "Heat shield" material will arrive with them. RED 5 expect to release their 2006 version of the Williams FW28 in about 3 months. 6/10/06, I have just added another page to the website "Finishing Materials". 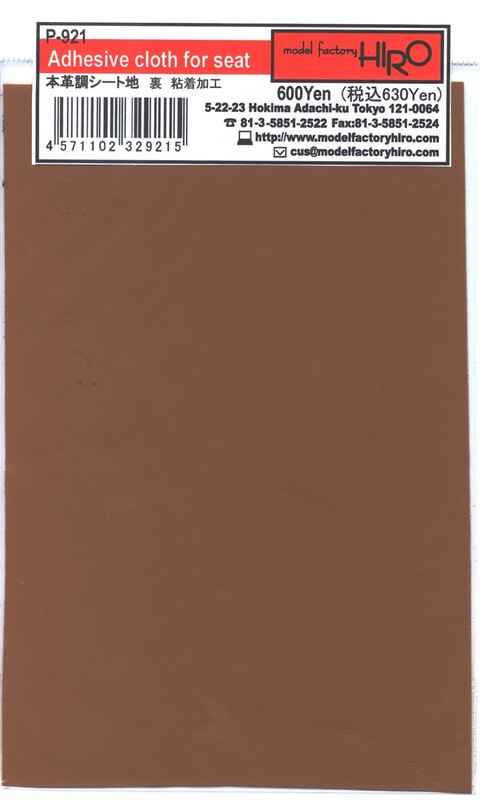 At the moment it is only paints and what has always been at the bottom of Store pages. Many of you have asked if I would carry Finishers paints, well now I do. See I do listen. :) I do not have their full range in stock and I will only keep a small stock. However, it will only take me approximately 5 days to have colors in stock that are available. So if you want something, let me know. I also carry Albedo paints from Brazil Both these brands are high quality and carry better matches for some models, than can be found on the market. Most all of them come "airbrush ready" so no need to worry about mix ratios. I will also be carrying Alclad paints, which will be arriving soon. All the paints listed are what I have in stock. 6/8/06, As of today I am able to accept Credit Cards, VISA, MC, Discover and AMEX. It is still in the primitive form........either Fax your info to me at 602-923-7671 or email it in two or 3 separate emails, or call 480-258-1050 and leave the information with me. This should only be for a couple more weeks while I figure out all the "Shopping Carts" out there. Still email me for totals including shipping and I will send you an invoice. Finishers paints and Albedo paints will be on the web in about 5 to 8 days, when I have them in stock. 5/27/06, I have just added some reference material. It is mostly "F1 Modeling" magazines. I also changed the "F1 stuff" button to read "Ref. Material. 5/23/06, I have added some new models from ACE Models in Brazil for pre-order, due in mid June. They have also officially announced the upcoming release of the Tyrrell 006, which is a completely new model with; more parts, more detail and more versions, not a re-release of the original AMD. I am completing a new order this week to MFH and have listed the ones as "soon". They should be in stock by June 2nd. (I just typed the month 3 times before reaching June, I was going backwards). I should have a 3D EXE. file, hopefully on the website, in a couple of weeks to show..........................the MP4/6 Wheels! I have also added a little to the 72C progress diary. 5/12/06, Studio 27 Lotus 72D arrived today. I only have 3 2 of the 100 issued. 4/13/06, Well I'm obviously back from my trip to England. I have a lot of catching up on orders made while I was away. I have added some new items from MERI in the 1:20 store, namely Intake Trumpets/Velocity stacks for Ford V8 and Honda V10 engines. I have also restocked on the Tameo spoked wheel sets for the 50's and 60's race cars in 1:43 scale. Plus I am taking orders on the Studio 27/MFH Lotus 72D, I will only be carrying the limited edition model DX2024. I am also taking Pre-Orders for the Lotus 72C by MFH which should be released soon. I will be putting the story of my trip to England and Classic Team Lotus in the Race Trips page (although it was not really a race trip) it was fast! :). 4/3/06, ACE models Ligiers arrived today, even before the Minardi's which are on their way to me right now. So if you want one of the latest Ace models, let me know. Don't forget I will not be shipping anything between April 6th and 12th, because of my trip to England. 3/28/06, I have added more detail parts from MFH in the 1:20 store. RED 5, The Minardi PS05's are on the way to me, along with some other little detail goodies from RED 5, "Legality Planks" individual planks to add to other 1:20 models. I should have them by April 6th. 3/12/06, AZRM, I have added more progress pictures on the MP4/6 Brazil End plates and Wings. 3/11/06, RED 5 have announced they will be doing a "Recall" on the all metal MP4/20. What that means is; anyone who purchased one of the all metal MP4/20's will be able to go to RED 5,s website www.redfive.com.br and tell them where and when you purchased the model. After they have confirmed that information they will send you a resin tub to replace the metal one, including some more decals for later in the season, for the cost of shipping. Which I think is excellent! The Minardi PS05 is also finished and will be ready for shipping in the next few days, I am just waiting for pricing from Brazil. Now is the time to Pre-Order! No money down! 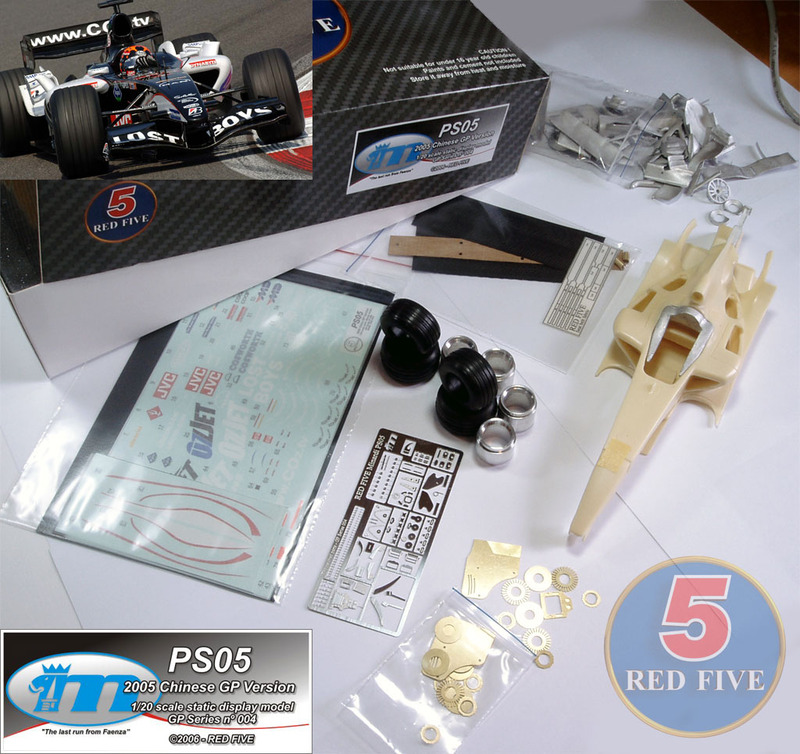 RED 5, The Minardi PS05 will be ready for shipping in approx. 2 weeks. I am accepting "Pre-orders" on these now. I expect the price for pre-order is going to be approx $155.00. If you pre-order and then don't like the price, you don't have to buy it. Around the same time they are releasing a trans-kit for the McLaren MP4/20, late season, which will include a new resin tub. 2/20/06, I have just changed the 1:20 STORE to show the models that are available for Pre-Order listed first. Anyone pre-ordering will get them at the price shown in the description. Once they arrive the price will be as shown in the price column. 2/19/06. Mac's Modeling is now, Mac's Modeling LLC, all official The BIG news, is I am licensed by "Classic Team Lotus" to produce a 1:12 conversion kit for Tamiya's Lotus 72D to make it the 72C. I could not get it for 1:20 scale as "a company that is producing the 72D has reserved the rights to the 72C for future release". There is going to be a lot of work in that. I have added some progress pictures of the Carbon Fiber end plates, for you all to see that they are actual Carbon Fiber, not decals as some people thought, and check out the size of weave. 2/17/06, The new Driver figures have arrived. 1:20 and 1:24 scale. Better than I thought. 2/7/06, The latest order from MFH has arrived today. I tell you I can hardly believe the detail on the 1:24 Ferrari 312 F1 1969! It is amazing and definitely worth the money. For 1:24 fans, you will love it! 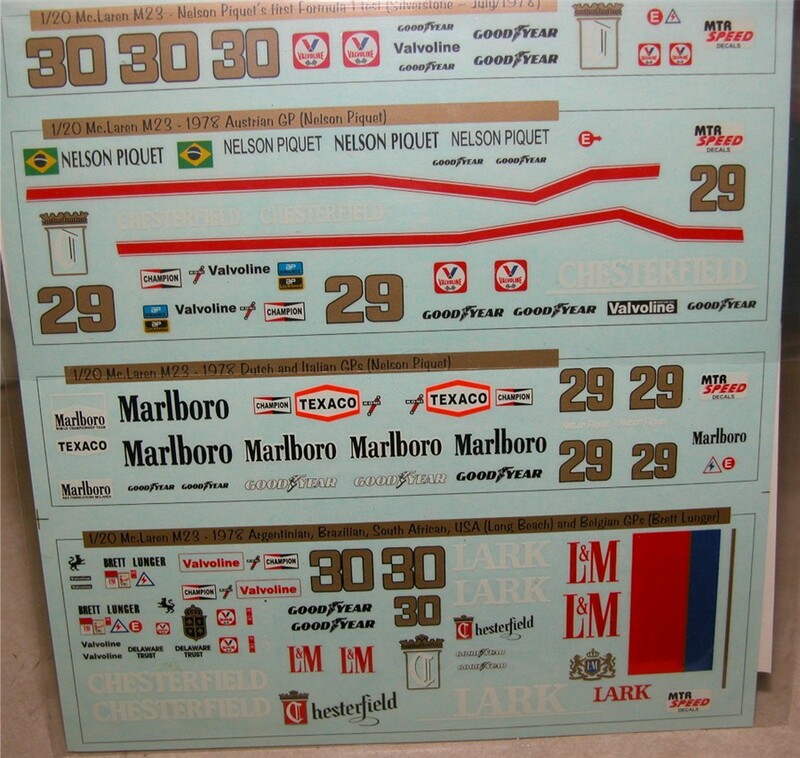 So I am also restocked with Williams FW16, San Marino and Brazil versions, and the Toleman-Hart 184, Monaco version. 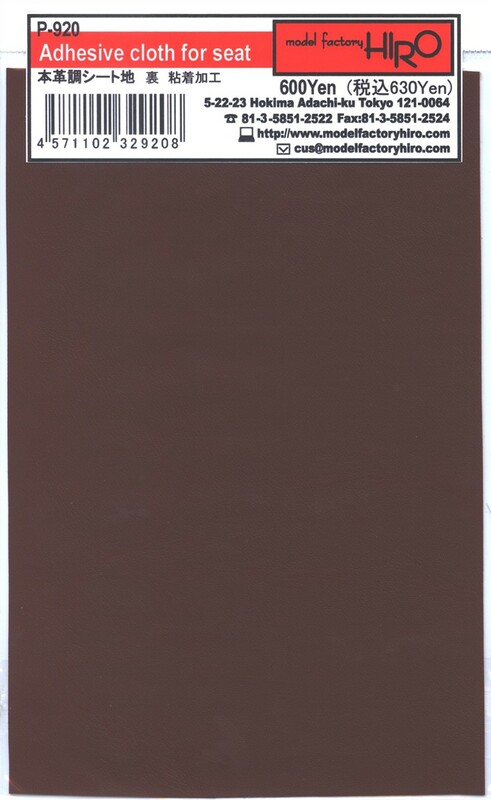 I also have some detail material, which is a leather look-a-like self adhesive material in sheets 4" x 6", 4 different colors are available, Black, Brown, Ocher and Dark Brown. It is listed in the 1:24 and 1:20 stores. 1/31/06, Well it had to happen some time. :) I have added a 1:24 scale store. 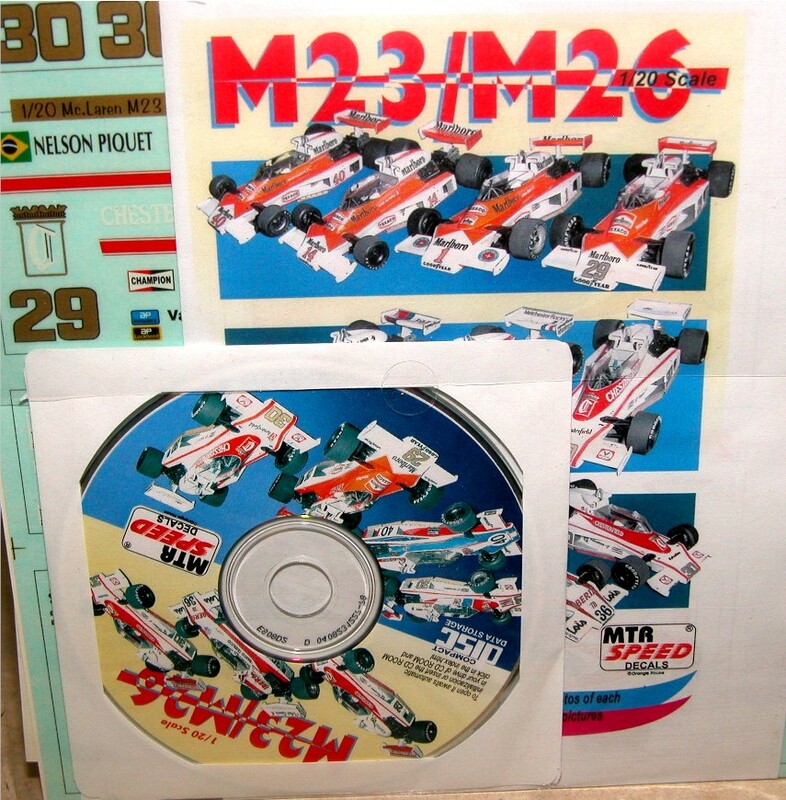 It is very small, but does have the latest released decals from MSM Creation, the McLaren MP4/20B Test decals for the Revell Model, the Test Decals for the 1997 McLaren MP4/12 and the conversion decals, to convert the Revell F2003-GA to the Sauber C23. I will be ordering some MFH 1:24 scale models soon. I have added some more MFH models and MSM Creation decals to the 1:20 store. I ordered more Toleman's for Senna fans and Williams FW16's. Should be in stock within a week. 1/21/06, MFH Williams FW16, San Marino version, arrived early and I have sold out already! I will see if there are any of the FW16, Pacific and Brazil versions still available. I have decided to keep the Toleman for my collection. However, if you want any of the Toleman versions email me and I will order them for you. 1/15/06, MFH Williams FW16, San Marino version, will be in stock January 23rd, however, orders have been great for this model and there is only one left! I will also receive the Toleman 184 as driven by Senna at Monaco the same day. The Lotus 72D should be available some time during February. I'm not sure of the price on those yet. RED 5 are considering producing a full detail model of the McLaren MP4/14, they will let me know soon as to when to expect it. They tell me the Minardi is coming along nicely. Provence Miniatures, (formerly Provence Moulage) have finished their 1:20 version of the Lotus 72D and I should have some before the end of January, I hope! 12/25/05, I just thought I would let you know, that with AMD, ACE, WOLF, ORANGE HOUSE, and RED 5 models, they tend to sell out very quickly as they are limited editions of 100 units. So most will not get restocked once they are sold out. I will put notes next to models that could be re-released if quantities of pre-orders are enough. Also RED 5 will be producing a curbside model of the Last Minardi, so all you Minardi fans put in your pre-orders with me so as not to be disappointed, as I think these will sell out rather quickly. 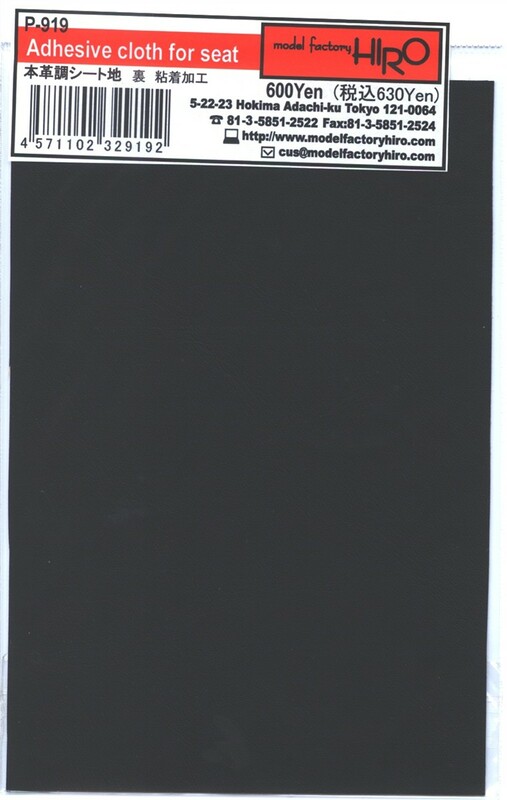 12/23/05 I will very soon be offering Model Factory Hiro and Studio 27 models, plus a full range of Sakatsu detail parts. See the latest NEWS above. 12/22/05 The second delivery of RED 5's McLaren MP4/20 arrived today and are ready for shipping. Improved packing on this shipment. I also have restocks of the Jag and Ferrari F2004. I added "El Oso" F1 figures to the 1:12 and 1:20 stores today. I also added MSM Creation decals for F1. There will be a lot more of these products shortly. This stock is the F1 stock I have taken over from DADS website. Dave is concentrating on Motorcycles. MTR SPEED/Orange House 11/28/05: McLaren M23's 1:20 scale have arrived and are for sale, Special at $150.00. They look great for an all Metal full detail model. The options with the decals are amazing! 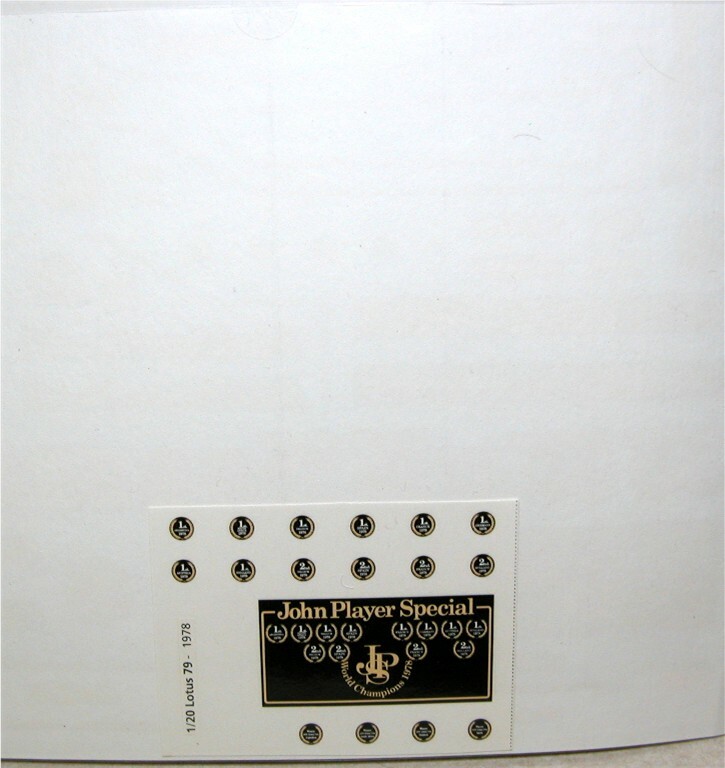 (Sold out for now) I have also received the 1:12 decals for Lotus of Jochen Rindt, Gold Leaf (I am also going to receive some in 1:20 scale). Should be here in the next 7 days. 11/14/05 Tameo 1:43 metal kits in the 1:43 store Included is the latest Tameo edition: The Lotus Ford 72C Gold Leaf car of J. Rindt WCT70 World Champion, full detail series.. Also the NEW MP4/4 and MP4/6 also WC series and full detail. MTR Speed have two new sets of decals they have just released. The first is for Tamiya's Lotus 78 as driven by Hector Rebaque click HERE to see the pictures and more info. Also they are releasing a set of 1:12 scale decals for Tamiya's Yardley M23, which includes decals, photo etch parts, resin parts and white metal parts, which will give you all the options for the car as driven in 1973 and 1974, click HERE to see the pictures and get more information. (I can also offer just the decal portion of this set) These items are not cheap, but are excellent products and I believe great value for money. I will only get these on a pr-order basis. Please email me at preorders@macsmodeling.com and I will order enough for all who order. Very soon I will be offering Denizen 1:43 scale white metal driving figures for Formula 1 covering years from the 50's to present day. I have some in stock now, but have to get them listed in the 1:43 store. Formula 1 Model release NEWS!! "Last Minardi" as a curbside model. Next Release. Formula 1 Detail parts NEWS! production costs reduced to make them affordable now. 1:12 scale Aluminum wheels for McLaren MP4/6, Ferrari 641/2 and Williams FW14B, complete and anodized black. 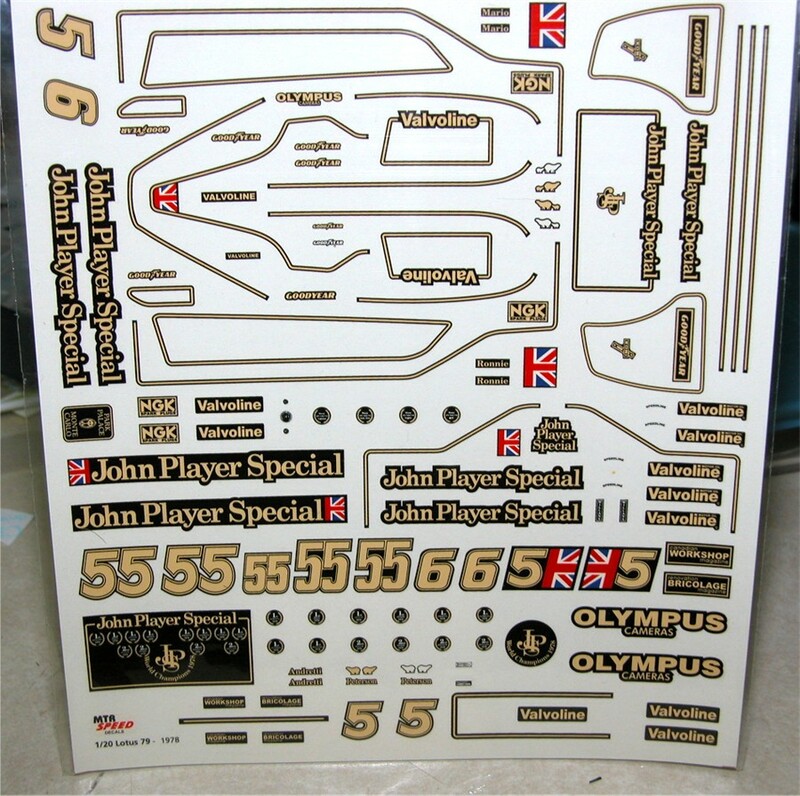 Available now 1:20 scale MTR SPEED decals for Lotus 79 These decals may seem expensive, but they are some of the best and most accurate that I have seen. Take a good look at the pictures (1) and (2) although they do not do them justice.